Enjoy plenty of swimming, boating, fishing, snowmobiling or simply relaxing and watching the sunset from your deck. Birch Hollow is a cozy vacation rental cabin on Devil Track Lake. This 2 bedroom, 1 bathroom, 1 story cabin is located just steps away from the Devil Track Lake Shoreline. Enjoy a small rock beach, perfect for launching canoes and kayaks. This fantastic view of Devil Track Lake can be enjoyed from the home, front porch, and large yard. The living room is great for relaxing after a long day on the lake. Curl up on the couch and watch a movie on the flat screen TV. The sofa folds out to provide an additional sleeping area. Or turn on the gas fireplace on cold evenings and curl up in the chair with a good book. The open living area is great for spending time with each other. Enjoy great views from the large living room windows. The living room is open to the kitchen area. The kitchen is equipped with the basic necessities for preparing a meal during your stay. Enjoy the views of Devil Track Lake while doing dishes at the sink. Enjoy watching a movie with your family even while preparing meals. There`s seating for four in at the dining table additional seating at the kitchen counter for 2. When you enter the home from the road side you are in this open living area. The first bedroom has a queen bed, TV, and great Devil Track Lake views. Enjoy watching a movie as you drift off to sleep at night. You will be greeted by these great views when you wake up in the morning. The second bedroom has twin trundle beds the second bed pulls out from below. The small room is great for kids The bathroom has a walk-in shower. The one cozy bathroom will be shared by all guests. The driveway you will come down to start your vacation at Birch Hollow. Birch Hollow as you will see it when you pull into the driveway. Walk around the side of the house to take in the beautiful Devil Track Lake views The front of the home features a nice deck and BBQ. You can enjoy a meal on the deck while taking in the sites and sounds of Devil Track Lake. The fire pit is great for making smores. Devil Track Lake is a popular swimming, boating, and fishing lake. You can do all three from the shoreline. Launch your boats from the sandy area or use this to take a dip on a hot summer`s day. Looking east down Devil Track Lake. Straight across the lake looking north. The looking west. Birch Hollow is sure to be a favorite destination for your family for years to come Come visit and call Birch Hollow you Grand Marais home away from home. You'll discover that this beautiful pet-friendly Grand Marais vacation rental home is well known for its beautiful sunsets along the shores of Devil Track Lake. Enjoy the clear skies and the Northern Lights from the comfort of the home's lake-facing deck or while dipping your feet into the waters of the lake. Located in a peaceful lake-front setting, you'll find plenty of quiet, rest, and relaxation at Birth Hollow. 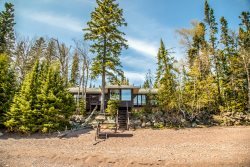 Birch Hollow is a cozy two bedroom, one bathroom, one story cabin on the south shore of this popular recreational lake, just 7 miles from Grand Marais. The home features a stone-faced gas fireplace, wood interior and wood floors, sofa sleeper in living room, and walk-in shower. Cute, quiet, and cozy are words that can be used to describe Birch Hollow. Get away from it all while still being in a nice location conducive to exploring the beautiful North Shore area of Lake Superior. You are just a couple of miles from the Gunflint Hills Golf Course for a relaxing round of golf. Pincushion Mountain is also a short drive away and has miles of hiking trails. Drive into Grand Marais to enjoy a day of shopping and dining at the many unique, locally-owned shops and restaurants along the Grand Marais Harbor. Take the short stroll out to Artist's Point and the Grand Marais Lighthouse to really experience Lake Superior. In the evenings, head around to the north shore of Devil Track Lake by car or canoe to Skyport Lodge and Raven Rock Grill, Devil Track Lake's popular restaurant and bar, serving a full menu and offering a lively ambience for the Devil Track Lake community. Return home and light a fire in the outdoor fire ring, where you can sit around with friends and family roasting marshmallows and sharing the stories of your North Shore adventures. Whether you've come to the Devil Track Lake area to relax or find an adventure, Birch Hollow is a great place to call "home" during your stay. Location was great. Cabin was nice with a very well stocked kitchen. Lake was amazing. Bed was comfortable. Really only thing we weren't happy with (besides the weather :() was the lighting in the cabin was too low and not enough. The cozy cabin had beautiful views, but the construction occurring next door put a damper on the piece and quiet we were hoping for. The cabin was clean but a bit cluttered and the queen size bed needs to be replaced. I have always found your staff helpful when needed. This is a cozy northwoods style cabin located on Devil Track Lake. We enjoy the pine paneling and comfortable casual furnishings. Some additional pendant lighting over the kitchen sink and stove would be nice, as well as a can light in the shower. Wish the property included a canoe so we could easily explore the lake. We needed a quiet and serene getaway and we found it at your cabin! It was so very peaceful and relaxing. The cabin is very well stocked and comfortable. We enjoyed the beautiful lake and the three different families of mama and baby ducks that came to visit several times a day. One night as we sat on the waters edge one family of baby ducks walked right up to us and bit on our shoes and pant legs - it was so much fun!! Thank you for sharing your cabin with us - we had an incredible time! This was a perfect location for us. Our daughter and family live next door to Birch Hollow in a very small house. Being able to rent Birch Hollow made visiting them very comfortable for all. The cabin is nicely furnished, a well equipped kitchen, comfortable bed, great view of the lake, and good bird watching. Cabin was great, stocked very well! Only complaint were the mosquitoes, too many to enjoy the outside much. Telstar is a product that is safe to use around people and pets that works great for mosquito control outdoors- might be an option for your inland lakeside cabins. Would reccomend this spot in a heartbeat! Neat and clean. Close to G.M. great fishing right out front. A dock would bea nice addition. Very comfortable. We would return. Wow! Birch Hollow cabin was furnished far better than we expected. It had a good variety of books, and many of them. It had some outdoors games, including a horseshoe set. It had several maps scattered over the house of the immediate area (Devil's Track Lake) as well as a good portion of the North Shore. The furniture was very comfortable and the fireplace was wonderful. The kitchen was completely furnished. My wife and I really enjoyed the cabin's interior walls as well--it was completely finished in pine.